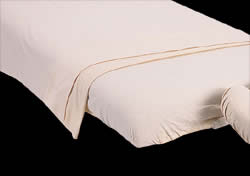 This standard flat sheet is made with 3.8oz. weight, 100% domestic cotton flannel. The standard flat sheet is 46" wide and 88" long prior to washing. If these measurements do not fit within your needs, please see our wide flat sheet or contact us for custom sizing.